The signs of fall are everywhere: dew on the grass when we wake up in the morning; leaves turning gold, orange and blazing red; afternoons of ferocious downpours alternating with pleasant light-jacket weather. It's a wonderful season and not least because of the way we celebrate it. On Oct. 2, Tualatin's quirkiest and most beloved festival will return after missing a year. 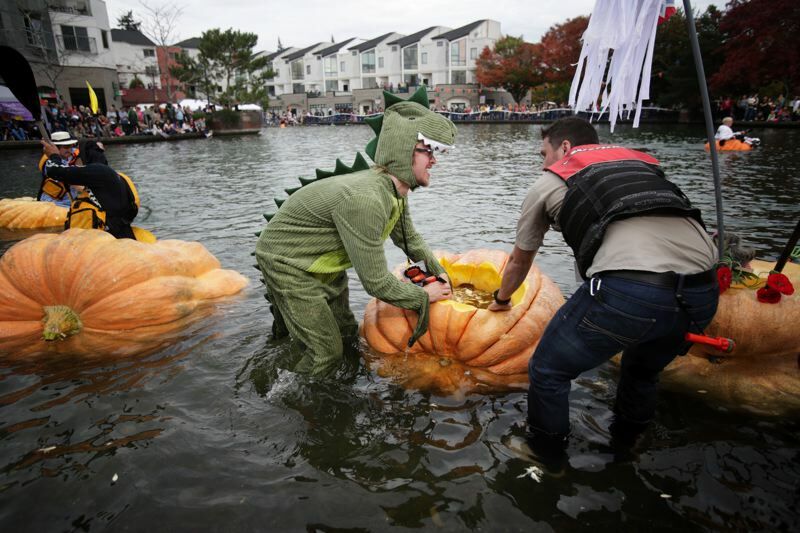 The West Coast Giant Pumpkin Regatta was canceled last year due to high winds in the forecast. Organizers are trying to make it up to people as best they can: Anyone who signed up to paddle in its centerpiece event, a series of races across the Lake of the Commons in hollowed-out pumpkin boats, is eligible to race this year. Recently, Sherwood celebrated another unusual annual tradition: the Great Onion Festival. Newcomers to the area, and even some more settled residents, might not realize it — but Sherwood, like much of the area along the Tualatin River, is built on the site of what used to be a staple industry in Washington County. Onion farming powered the local economy during the middle decades of the 20th century, long before the "Silicon Forest" or the suburban boom in the Southwest Corridor. In September, Beaverton held its International Celebration, part of National Welcoming Week. The Sept. 16 festival was a cultural showcase commemorating the diversity of Beaverton, including the contributions made to the community by immigrants who have settled in the area. A similar event, the Latino Festival, lit up Tigard's Main Street in September as well, following the annual Downtown Street Fair. Live music and tasty food entertained a multicultural crowd in the heart of one of Oregon's fastest-growing cities. These festivals represent everything that makes our communities great. They represent their quirky character and willingness to push the envelope. They pay homage to our history, a nod to the way the land used to be. And they celebrate our present and our future, who we are and the way we live. How do you bring more than 10,000 people together around a manmade lake that used to be a dog food factory? Getting people to put on crazy costumes, clamber into giant pumpkins and race each other is a good way to start. But that discounts the crowds that show up hours before the regatta itself begins. It discounts the students and adults who participate in the "Regatta Run," a 5K event before the festival that raises money for the Cpl. Matthew Lembke Memorial Scholarship — a fitting way to pay tribute to the memory of a local young man killed in action in Afghanistan. It's an attraction, yes, and it's a lot of fun. But it doesn't quite encapsulate what the day is all about. Tualatin is a new town. While Beaverton and Tigard grew dramatically during the 1970s, Tualatin barely existed at all before then. Sherwood took until the 1990s to explode in size. King City has blown up only since the turn of the century, with plans to expand even farther. And one of the things that urban planners sometimes overlook is that it's easy, after a fashion, to build roads and strip malls and subdivisions, but it's a lot harder to build community. That's what Tigard City Council President Jason Snider meant Oct. 15 when he emphasized the way that residents of the Bull Mountain neighborhood came together not only to build a park but to create a community. A community is something that pulls together all different people, from different backgrounds, walks of life and personal perspectives, for a common purpose. It's more than people just living and working side by side. It's people proud to celebrate a sense of place and coming together to make that place a better place to be.